The DeLaMare Science & Engineering Library at the University of Nevada-Reno is, for the most part, a typical collegiate library. It has approximately 1200 active journal subscriptions, 100,000 volumes of monographs, bound journals, and government documents, and - of course - a whole bunch of books. It houses materials on everything from earth sciences to metallurgical engineering. It also is home to about a dozen SparkFun Inventor's Kits. For us, this is kind of mind-blowing. 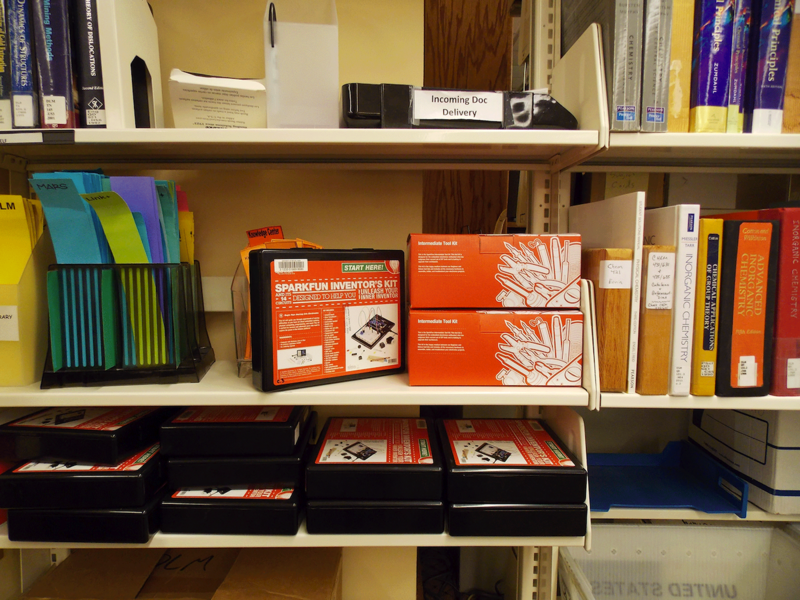 Five years ago, we never would have thought you could "check out" a SparkFun kit at the library. But, lo and behold, you can! We recently spoke with Tod Colegrove, Head of the DeLaMare Library, who told us that not only are SparkFun products on the shelves, but they are proving to be quite popular. It's awesome that students are able to check out a SparkFun kit and get a taste of embedded electronics. One of the students, after checking out an inventor's kit (and in typical collegiate fashion), built a DIY breathalyzer. Very cool! Check out his project page to see how you can build your own. Thanks to Tod and the DeLaMare Library for making us aware of this awesome development! Cool idea! My wife works for the public library here in Louisville, CO. I'll ask her to present the idea to the library director. If I had the cash, I would donate some to the local library. Would the educational discount apply to that purchase? Please email education@sparkfun.com about this..
That's absolutely brilliant! If I had had the opportunity to check out an SFE Inventor's Kit in college, who knows, maybe I would have stayed the full four years! Ahh so close... Now if only they would stock them at University of Nevada, Las Vegas. I wish my library had this!! turn the libraries into a rent-a-hobby-shop!!! We actually have one of these at work. We have about 50 or 60 development boards and kits from various manufacturers (including some from SparkFun) that have been used over the years for various projects. We also have different programmers too. Anybody can check them out. It works pretty well, and we keep a Wiki page with the status of all of the kits with links to their datasheets and schematics. I have been wanting to build a breathalyzer for ages. And now i will!